PASCO -- Franklin County commissioners want the Army Corps of Engineers to reconsider regulations they fear will mean the end of most private docks on the Columbia River. Commission chairman Brad Peck said he has met with about 60 county residents who are concerned about the proposed dock rules, and he and members of that group have been talking with the Corps. The commissioners also sent a letter to Sen. Maria Cantwell on Friday, asking for her assistance. The concerns come because the Corps is revising its McNary Shoreline Management Plan to address current laws affecting fish survival and cultural resources. Cindy Boen, Corps project manager for the plan, said the last McNary shoreline plan was done in 1982. She said the changes in dock regulations are needed to reduce effects they can have by harboring predators that eat young salmon and steelhead. The guidelines are designed to maximize light penetration around docks, increase water depth and minimize structures, she said. But Franklin commissioners and dock owners are challenging the restrictions. Peck said there is not scientific proof that the docks harm young salmon. He said a study by local fisheries researcher Dennis Dauble found young salmon travel in deep water in the middle of the river, not along the shoreline. He said that study helped convince the Corps to approve the Lee Boulevard dock in Richland that was built in 2003. 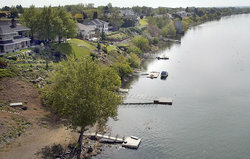 Peck charged that the Corps study, which was peer-reviewed by the U.S. Geological Survey, lacked numbers to establish how the docks affect fish. "They dreamed up a standard and now they are attempting to force others to live up to it," he said. Michael Korenko, a Pasco dock owner, said the new guidelines would eliminate most private docks. Korenko said he has reviewed 800 pages of studies relating to the issue and none showed docks had a measurable effect on salmon survival. If there was proof the docks hurt salmon, he said, he and others would gladly make changes. The depth requirement would kill many docks, said Rod Webring, a Pasco dock owner. Most, including his own, wouldn't meet the 10-foot minimum water depth requirement. Webring said docks provide benefits to fish in shallow water by keeping boats away from the shoreline. Boen said the guidelines have been written to minimize effects on current dock owners. Existing docks won't need to be changed, but when properties with docks are sold, the new owners would need to meet the guidelines, she said. Commissioner Rick Miller said the docks shouldn't have to be brought to the new standards when property is sold. He said the docks cover only as much river as a postage stamp on a football field. Use of the river is part of quality of life in the county, Miller said. "People should be able to enjoy this river," he said. But Boen said the McNary shoreline is critical habitat for fish considered endangered or threatened under the federal Endangered Species Act. She also said the Corps must serve the public interest, and "docks are private facilities on public property." She said the plan will be revised based on public comments before it is submitted to the National Oceanic and Atmospheric Administration this summer for review. NOAA may approve it or ask the Corps to make changes. Boen said the Corps could have a final plan in January.